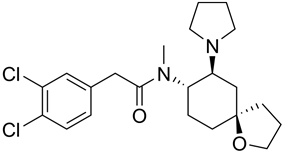 Spiradoline (U-62066) is a drug which acts as a highly selective κ-opioid agonist. It has analgesic, diuretic and antitussive effects, and produces subjective effects in animals similar to those of ketocyclazocine and allylnormetazocine. The main effect in humans is sedation, along with analgesic and diuretic effects, but significant side effects such as dysphoria and hallucinations have stopped it from being used clinically. Kappa-agonists have been shown to react negatively with the mu receptor, instead of having an assumed synergy since they are both opioid receptors, such as with the mu (μ) receptors and delta (δ) receptors (which both mediate pain-relief, euphoria and overall potency of opioid effects).